You must be a member of the Tokyo Icebreaker Buddies Group to attend this activity. Would you like to join this group? Let us make dumpling party together, celebrate! boiled dumplings (or shui jiao, 水饺). to show you how to make dumpling in a high technical way. 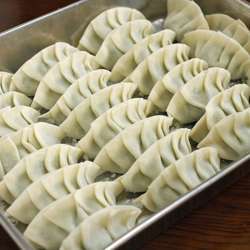 Don`t forget to invite your foodie friends come to make dumpling together. Coz I will get a reservation for the event, so if you can't make it please cancel your attending before 9th, Feb.
After 9th, Feb, you need to pay, please noted. Boiled dumplings are also the most important dish for celebrating Chinese (Lunar) New Year in northern China. My family eats them on New Year’s Eve, when all the family members are gathered at home. It is a ritual comparable to that of the roast turkey at Thanksgiving. The pronunciation of dumpling (饺子, jiao zi) phonetically also refers to the turning point between the old year and the new year. A dumpling is shaped like an ingot (the kind used as ancient Chinese money), and this shape symbolizes wealth. Eating dumplings is a way to bring good luck, so that everything goes well in the coming new year and that family can be together.